We understand the difficulty and hardship you and your family may be experiencing if someone close to you has passed away. In this time of difficulty, it’s important to focus on the positivity and the beauty of life. That’s exactly what LolaFlora flowers aim to remind you of; the positivity and the loving memories you have shared with the person who has passed away. Funeral flower arrangements are a great way to share the pain and to heal your sorrow. Sympathy flowers for funerals bring emotions and words into a physical and tangible object that is symbolic and beautiful in a variety of ways. 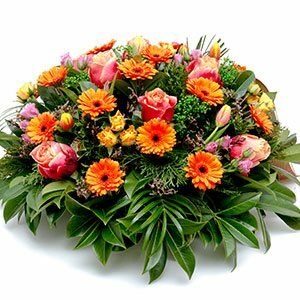 If you are planning to take the sympathy flowers with you to the funeral ceremony, we have a great selection that is specifically designed for funerals. Express your care or concern with pink roses, purple orchids or sunflowers. Also, if you are unable to hand deliver your flowers to the funeral, don’t worry. The flowers that we have online can easily be shipped right to the family to show your sympathy with the flowers. Why Is It a Good Idea to Get Funeral Flowers? Express your sympathy with funeral flower arrangements that we have specifically designed on our website at LolaFlora.com. Flowers are a great symbolic gift and help ease your sorrow. Send the condolence flowers right to the family to be delivered to their home address. Funeral wreaths or sprays can also be hand-delivered to the gravesite or crematorium. If you are out of town and unable to attend the memorial service or ceremony, order funeral flowers to show that you care. LolaFlora has a wide selection of online funeral flowers including bouquets, wreaths, plants and funeral casket tributes. If funds are limited, choose a budget-friendly, cheap funeral flower arrangement such as a carnation bouquet, peace lily plant or gerbera flower arrangement. Order lilies online for same-day, or next-day delivery.